Christopher S. Claremont (/ˈklɛərmɒnt/; born November 25, 1950) is a British-born American comic book writer and novelist, known for his 1975–1991 stint on Uncanny X-Men, far longer than that of any other writer, during which he is credited with developing strong female characters as well as introducing complex literary themes into superhero narratives, turning the once underachieving comic into one of Marvel's most popular series. During his tenure at Marvel, Claremont co-created numerous X-Men characters, such as Rogue, Psylocke, Shadowcat, Phoenix, The Brood, Lockheed, Shi'ar, Shi'ar Imperial Guard, Mystique, Destiny, Selene, Reverend William Stryker, Lady Mastermind, Emma Frost, Tessa, Siryn, Jubilee, Rachel Summers, Madelyne Pryor, Moira MacTaggert, Lilandra, Shadow King, Cannonball, Warpath, Mirage, Wolfsbane, Karma, Cypher, Sabretooth, Empath, Sebastian Shaw, Donald Pierce, Avalanche, Pyro, Legion, Nimrod, Gateway, Strong Guy, Proteus, Mister Sinister, Marauders, Purifiers, Captain Britain, Sunspot, Forge and Gambit. Claremont scripted many classic stories, including "The Dark Phoenix Saga" and "Days of Future Past", on which he collaborated with John Byrne. He developed the character of Wolverine into a fan favorite. X-Men #1, the 1991 spinoff series premiere that Claremont co-wrote with Jim Lee, remains the best-selling comic book of all time, according to Guinness World Records. In 2015, Claremont and his X-Men collaborator John Byrne were entered into the Will Eisner Award Hall of Fame. Claremont was born in London, England, the son of an internist father and a pilot/caterer mother. Claremont is Jewish on his mother's side, and lived in a kibbutz in Israel during his youth. His family moved to the United States when he was three, and he was raised primarily on Long Island. Alienated by the sports-oriented suburbs, his grandmother purchased for him a subscription to Eagle when he was a child, and he grew up reading Dan Dare, finding them more exciting than the Batman and Superman comics of the 1950s and early 1960s. He read works by science fiction writers such as Robert Heinlein, as well as writers of other genres such as Rudyard Kipling and C. S. Forester. Claremont initially did not view the comic book industry as the place where he would make his career, as he believed the dwindling readership to be a sign that the industry was dying, and found the material being published to be uninteresting. Instead, when he began at Bard College, he did so as a political theorist, studying acting and political theory, and writing novels with the hope of becoming a director. His first professional sale was a prose story. He graduated in 1972. Claremont's career began in 1969, as a college undergraduate, when he was hired as a gofer/editorial assistant at Marvel Comics, during which time he received a plot assist credit for X-Men #59, written by Roy Thomas (cover dated August 1969). [note 1] Thomas later assigned Claremont his first professional scripting assignment, on Daredevil and the Black Widow #102 (Aug. 1973). As an entry into regular comics writing, Claremont was given the fledgling feature "Iron Fist" in Marvel Premiere as of issue #23 (Aug. 1975). He was joined two issues later by artist John Byrne. The Claremont/Byrne team continued to work together when the character received its own self-titled series in November 1975 which lasted 15 issues. Though his acting career did not yield great success, he functioned well at Marvel, where he obtained a full-time position. One of the first new characters created by Claremont was Madrox the Multiple Man in Giant-Size Fantastic Four #4 (Feb. 1975). Marvel's editor-in-chief at the time, Len Wein, who recognized Claremont's enthusiasm for the new X-Men that Wein and Dave Cockrum had created in 1975, hired Claremont, a relatively young writer, to take over the series as of issue #94 (May 1975), reasoning that doing so would not draw opposition from other writers, given the book's poor standing. Claremont approached the job as a method actor, developing the characters by examining their motives, desires and individual personalities. This approach drew immediate positive reaction. According to former Marvel editor-in-chief Bob Harras, "He lived it and breathed it. He would write whole paragraphs about what people were wearing. He really got into these people's thoughts, hopes, dreams." Claremont's take on the series has been likened to writing "the Great American Novel about complex characters who just happened to fly", incorporating surprise character developments and emotional nuances amid the operatic battles that otherwise typified American superhero comics. By his own admission, Claremont acquired a reputation for taking a long time to resolve plot threads, and longtime X-Men editor Louise Simonson recounted that whenever he was at a loss for story ideas, "All I'd have to do was go through all of the plot threads that he had left for the last year or two." Claremont introduced new supporting characters to the X-Men series including Moira MacTaggert in issue #96 and Lilandra Neramani in #97. Jean Grey a.k.a. Marvel Girl, one of Marvel's first female heroes, underwent a huge transformation into the omnipotent Phoenix. Issue #107 (Oct. 1977) saw the introduction of the Starjammers as well as the departure of artist Dave Cockrum. Claremont began his collaboration with artist John Byrne in the following issue. During his 17 years as X-Men writer, Claremont wrote or co-wrote many classic X-Men stories, such as "The Dark Phoenix Saga" and "Days of Future Past". Comics writers and historians Roy Thomas and Peter Sanderson observed that "'The Dark Phoenix Saga' is to Claremont and Byrne what the 'Galactus Trilogy' is to Stan Lee and Jack Kirby. It is a landmark in Marvel history, showcasing its creators' work at the height of their abilities." Comics historian Les Daniels noted that "The controversial story created a sensation and The X-Men became the comic book to watch." In 2010, Comics Bulletin ranked Claremont and Byrne's run on The X-Men second on its list of the "Top 10 1970s Marvels". Claremont and artist Frank Miller crafted a Wolverine limited series in 1982. With artist Walt Simonson, Claremont produced The Uncanny X-Men and The New Teen Titans in 1982, an intercompany crossover between the top-selling Marvel and DC titles. The New Mutants were introduced by Claremont and Bob McLeod in Marvel Graphic Novel #4 (Dec. 1982) and received their own ongoing series soon after. The second X-Men film was loosely based on his X-Men graphic novel God Loves, Man Kills. Besides his work on X-Men and its spinoffs, Claremont wrote Marvel Team-Up, Spider-Woman and Ms. Marvel during this time. He and artist John Bolton created the Marada the She-Wolf character in 1981. Claremont's stories for Marvel Team-Up included the cast of NBC's Saturday Night Live appearing in issue #74 (Oct. 1978) and the introduction of Karma, a character that later joined the New Mutants, in #100 (Dec. 1980). Claremont helped launch the Marvel Fanfare title in March 1982. Claremont co-created numerous other important female X-Men characters, including Rogue, Psylocke, Mariko Yashida, Shadowcat, Phoenix, Mystique, Lady Mastermind, Emma Frost, Siryn, Rachel Summers, Madelyne Pryor, and Jubilee. He co-created such notable male characters as Sabretooth, Pyro, Avalanche, Strong Guy, Captain Britain, Forge, Mister Sinister, and Gambit. Claremont launched various X-Men spin-offs, beginning with The New Mutants in 1982. The spinoffs Excalibur and Wolverine, initially written by Claremont, followed in 1987 and 1988, respectively. X-Men crossover stories written by Claremont during the latter half of his tenure on the series include "Mutant Massacre", "Fall of the Mutants", and "X-Tinction Agenda". In 1991, Marvel launched a second X-Men title simply called X-Men with Claremont and penciler Jim Lee as co-writers. X-Men #1 is still the best-selling comic book of all-time, with sales of over 8.1 million copies (and nearly $7 million), according to Guinness World Records, which presented honors to Claremont at the 2010 San Diego Comic-Con. The sales figures were generated in part by publishing the issue with four different variant covers which showed different characters from the book (and later a fifth gatefold cover that combined all four), large numbers of which were purchased by retailers, who anticipated fans and speculators who would buy multiple copies in order to acquire a complete collection of the covers. Claremont left the series after the first three-issue story arc, due to clashes with editor Bob Harras. The 1990s saw Claremont diversify his comics work, as he wrote for other publishers, and wrote his own creator-owned properties. In December 1991, he sent artist Whilce Portacio a proposal to illustrate Claremont's project, The Huntsman, as a creator-owned project, and when the then-new comics publisher Image Comics was announced in 1992, Claremont was named as one of its founders. However, the project was cancelled when Portacio decided instead to do Wetworks. Claremont attempted to find other artist for the series, but all those in whom he was interested were either drawing X-Men or had their own projects with Image, and thus he did not become one of Image's founders. In 1992 he wrote the graphic novel Star Trek: Debt of Honor, which was illustrated by Adam Hughes. In 1993, he began writing the 12-issue miniseries Aliens/Predator: Deadliest of the Species for Dark Horse Comics, which was completed in 1995. That year saw a decline in his comics output, however, as he turned his focus to writing novels, citing frustration with how the comics industry had become dominated by artists and editors. In 1994, he wrote issues #10-13 of Jim Lee and Brandon Choi's series, WildC.A.T.s at Image Comics, in which he finally introduced his creator-owned character, Huntsman. In 1995, Claremont began writing his creator-owned series, Sovereign Seven, which was published by DC Comics, running for 36 issues until 1998. Stan Lee interviewed Claremont for episode 7 of the 1991-92 documentary series The Comic Book Greats. In 1998, Claremont returned to Marvel as editorial director and the regular writer of Fantastic Four. He also wrote a Wolverine story arc. In 2000, as part of the company's "Revolution" event, he wrote Uncanny X-Men and X-Men until he moved to X-Treme X-Men with penciller Salvador Larroca. He returned to Uncanny X-Men again for a two-year run starting in 2004, while teaming up with his former Excalibur collaborator and artist, Alan Davis. In 2004, Claremont was co-writer on JLA issues #94–99, the "Tenth Circle" story arc for DC Comics, which reunited him with his former Uncanny X-Men artist John Byrne, with Jerry Ordway as inker. In 2007, Claremont returned to New Excalibur, writing a story arc in which the character Nocturne has a stroke. He has completed his first arc on Exiles, adding Psylocke to the team. In 2008 Claremont wrote the miniseries GeNEXT, followed by its 2009 sequel, GeNext: United. He was the writer of a X-Men Forever series which was set in an alternate universe, and focuses on the present day lives of the X-Men in a reality where Magneto never returned following the destruction of Asteroid M in X-Men #3 (December 1991). In 2010, Claremont collaborated with Italian comics artist Milo Manara on X-Women. As of 2014 Claremont was under an exclusive contract for Marvel. In April of that year, Marvel launched a Nightcrawler series with Claremont as writer, which he finished in March 2015. According to writer/editor Paul Levitz, Claremont's complex story structures "played a pivotal role in assembling the audience that enabled American comics to move to more mature and sophisticated storytelling, and the graphic novel." Claremont's editor on the series, Louise Simonson, attributes the X-Men's success to his approach to the characters: "Chris took them very seriously. They were real people to him." As the writer of X-Men, Claremont became known for certain characteristic phrases, such as Wolverine's saying, "I'm the best there is at what I do. And what I do...isn't very nice", which became closely associated with the character. A 2009 Slate article called Claremont the "soapiest writer in comic books.... The classic Claremont pose is either a character, head hung in shame with two enormous rivers of tears running down the cheeks as he or she delivers a self-loathing monologue, or a character with head thrown back and mouth open in a shout of rage, shaking tiny fists at heaven and vowing that the whole world will soon learn about his or her feelings." However, the article goes to state that "the genius of Chris Claremont was that he made mutants a generic stand-in for all minorities". In 1987 Claremont began writing genre novels. His first was a science-fiction trilogy about female USAF pilot/astronaut Nicole Shea, consisting of First Flight (1987), Grounded! (1991), and Sundowner (1994). Claremont co-wrote the Chronicles of the Shadow War trilogy, Shadow Moon (1995), Shadow Dawn (1996), and Shadow Star (1999), with George Lucas, which continued the story of Elora Danan from the movie Willow. Claremont was a contributor to the Wild Cards anthology series. Claremont made a cameo appearance in the opening scene of the 2006 film X-Men: The Last Stand, for which he is credited as "Lawnmower man". He made a cameo appearance as a Congressional committee member alongside fellow comic book writer Len Wein in an early scene in the 2014 film X-Men: Days of Future Past. In December 2010 Claremont appeared at a book signing at Borders Books at Penn Plaza in Manhattan as part of a series of events nationwide to commemorate World AIDS Day, with 25% of the proceeds of books sold at the event donated to Lifebeat, a nonprofit organization that educates young people on HIV/AIDS prevention. In July 2011 Claremont signed a deed of gift to Columbia University's Rare Book & Manuscript Library, donating his archives of all his major writing projects over the previous 40 years to the Library's nascent comics archives collection, forming the foundation of a research collection focusing on New York City-based cartoonists and comics writers. Following the examination and processing of the materials, which include notebooks, correspondence, early story drafts, plays, novels, comic books and materials from Claremont's early training in the theater and his career as an actor, Claremont's archive will be housed at the Rare Book & Manuscript Library in Butler Library, separate from the graphic novels collection, and will be open to anyone who demonstrates a need for its use, with a Finding Aid being made available online. Claremont's longtime editor Louise Simonson said, "his papers will provide many clues, not only to the evolving way comic books are created and presented, but also how they are perceived, licensed, bought and sold in America and around the world." A symposium called Comic New York was held March 24–25, 2012 at Columbia University's Low Memorial Library to mark the occasion, which was organized by Graphic Novels Librarian Karen Green, Professor Jeremy Dauber, and editor Danny Fingeroth. A discussion between Claremont and Simonson held in recognition of Claremont's gift was the keynote event of the symposium, which focused on the intertwined histories of American comics and New York City, which has served both as a breeding ground for creators and the home of the Big Two publishers, Marvel and DC. Signings and panel discussions with other creators, scholars and academics of the comics medium were held during the two-day event. Among the other creators in attendance were Paul Levitz, Al Jaffee, Peter Kuper, Denis Kitchen, Molly Crabapple, John Romita, John Romita Jr., Irwin Hasen, Miss Lasko-Gross and Dean Haspiel. In the mid-1970s, Claremont was married to Bonnie Wilford. Following the dissolution of that marriage, he married Beth Fleisher, with whom Claremont co-authored Dragon Moon. Fleisher is the cousin (through marriage) of editor Dan Raspler, who was the editor on JLA during the six-issue "Tenth Circle" story arc Claremont and John Byrne wrote in 2004. Claremont and Fleisher have twin sons. ^ According to Claremont, the reason for this credit is that he suggested the issue's resolution: that the Sentinels try to eliminate mutants through the source of mutation, the Sun. ^ Given name: cover, Marvel Graphic Novel #5: X-Men: God Loves, Man Kills. ^ Middle initial: "X-Mail" letter column, Uncanny X-Men #144 (Apr. 1981). ^ a b Claremont, Chris. Marvel Age Special: X-Men Anniversary Magazine vol. 1, #1 (Sept. 1993). ^ a b c d e Reid, Calvin (November 14, 2011). "X-Men Writer Chris Claremont Donates Archive to Columbia University". Publishers Weekly. Archived from the original on November 19, 2012. ^ a b c d e f g Foege, Alec (July 17, 2000). "The X-Men Files". New York Magazine. Archived from the original on September 1, 2013. ^ a b "Comic Legend Chris Claremont Allies with Borders for World AIDS Day". Comic Book Resources. November 26, 2010. Archived from the original on November 28, 2010. ^ "Chris Claremont". Fantastic Fiction. 2013. Archived from the original on September 14, 2013. Retrieved November 17, 2010. ^ Wilson, Larry (September 5, 2012). "Good guys win in the end— Must we wait for the 30th century??". Jewishworldnews.org. Archived from the original on December 1, 2013. Retrieved December 1, 2013. All that changed however in the mid 1970s when writer Chris Claremont came on board. Despite his non-Jewish-sounding name, this London-born, New York-raised lad is Jewish… he even spent time on an Israeli kibbutz in his youth. ^ Klotz, Bryan (June 2009). "Secret Identities: Graphic Literature and the Jewish- American Experience". University of Rhode Island. Retrieved May 24, 2014. ^ Sallis, Ted (October 12, 2011). "From Krakow to Krypton: Jews & Comic Books". Counter-Currents Publishing. ^ a b c d Vaughan, Owen (October 30, 2009). "Now where was I? The uncanny Chris Claremont on rejoining the X-Men". The Times. Archived from the original on December 1, 2013. ^ a b "X-Mail", Uncanny X-Men #164 (December 1982). Marvel Comics. ^ a b c "Charles Flint Kellogg Award in Arts and Letters". Bard College Catalogue. 2013. Archived from the original on December 1, 2013. ^ Claremont, Chris. "The Story Behind (Part of) The Story," "Web-Zingers," Marvel Team-Up #59 (July 1977). ^ Sanderson "1970s" in Gilbert (2008), p. 170: "The 'new' X-Men team...moved into this thirty-two-page bimonthly comic...and writer Chris Claremont took over the scripting." ^ Claremont, Chris (1988). "Introduction". X-Men: Asgardian Wars. Marvel Comics. pp. 6–7. ISBN 978-0871354341. ^ Sanderson "1970s" in Gilbert (2008), p. 171: "In this issue, the first to be plotted as well as scripted by Chris Claremont, Claremont and artist Dave Cockrum introduced geneticist Moira MacTaggert." ^ Sanderson "1970s" in Gilbert (2008), p. 175: "Writer Chris Claremont and artist Dave Cockrum also introduced the alien Shi'ar race, the Shi'ar Princess Lilandra, and covert agent Erik the Red in X-Men #97." ^ Sanderson "1970s" in Gilbert (2008), p. 176: "The transformation of Jean Grey into Phoenix was a dramatic affair...Writer Chris Claremont and artist Dave Cockrum's intent in transforming Jean Grey into Phoenix was to boost Jean's powers to a higher level." ^ Sanderson "1970s" in Gilbert (2008), p. 181: "Cockrum and writer Chris Claremont introduced the Starjammers, a band of space pirates led by Corsair." ^ Sanderson "1970s" in Gilbert (2008), p. 181: "When 'new' X-Men co-creator Dave Cockrum left the series, John Byrne took over as penciler and co-plotter. In his first issue, Byrne and writer Chris Claremont wound up the Shi'ar story arc." ^ DeFalco, Tom "1980s" in Gilbert (2008), p. 196: "In January  a nine-part story began that changed the X-Men forever...Claremont proposed a story that would show how Jean Grey - one of the original members of the X-Men - had become corrupted by her new Phoenix power." ^ a b DeFalco "1980s" in Gilbert (2008), p. 200: "The Sentinels ruled the earth in an alternate reality...The Uncanny X-Men #141 also introduced Rachel Summers, the daughter of Scott Summers and Jean Grey, who was born in the 'Days of Future Past' timeline." ^ Thomas, Roy; Sanderson, Peter (2007). The Marvel Vault: A Museum-in-a-Book with Rare Collectibles from the World of Marvel. Philadelphia, Pennsylvania: Running Press. p. 136. ISBN 978-0762428441. ^ Daniels, Les (1991). "The Marvel Universe (1978-1990)". Marvel: Five Fabulous Decades of the World's Greatest Comics. New York City: Harry N. Abrams. p. 186. ISBN 9780810938212. ^ DeFalco "1980s" in Gilbert (2008), p. 208: "The most popular member of the X-Men was finally featured in his first solo title, a four-issue limited series by writer Chris Claremont and writer/artist Frank Miller." ^ Brown, Jonathan (August 2013). "The Uncanny X-Men and The New Teen Titans: The Breakfast Club of the Comics Crossover". Back Issue!. Raleigh, North Carolina: TwoMorrows Publishing (66): 68. ^ DeFalco "1980s" in Gilbert (2008), p. 209: "Writer Chris Claremont proposed The New Mutants and artist Bob McLeod was brought in to design the characters." ^ Brown, Scott (May 2, 2003). "The NeXt Level". Entertainment Weekly. Archived from the original on October 2, 2013. Retrieved February 18, 2008. ^ Sanderson "1970s" in Gilbert (2008), p. 185: "Later writers in the fifty-issue run of this series included Chris Claremont, a specialist in portraying self-reliant heroines." ^ Sanderson "1970s" in Gilbert (2008), p. 186: "Ms. Marvel's...series was in the hands of Chris Claremont...and Dave Cockrum, a master of imaginative costume design." ^ Catron, Michael (August 1981). "Red Sonja/Marada Tale Yanked from Bizarre Adventures". Amazing Heroes. Stamford, Connecticut: Fantagraphics Books (3): 16. ^ Aushenker, Michael (August 2013). "That Other Spider-Man Title...Marvel Team-Up Offered an Alternative Spidey Experience". Back Issue!. Raleigh, North Carolina: TwoMorrows Publishing (66): 15–22. ^ Manning "1970s" in Gilbert (2012), p. 104: "The web-slinger found himself sharing the stage with a cast who had dressed as super-heroes to attack the [Silver] Samurai's gang in this quirky tale written by Chris Claremont and penciled by Bob Hall." ^ Manning "1980s" in Gilbert (2012), p. 117: "1980 was a year for anniversary issues, and this centennial effort by writer Chris Claremont and artist Frank Miller was one of them...Future New Mutant Karma also made her debut." ^ Manning "1980s" in Gilbert (2012), p. 126: "The debut issue featured the inspired pairing of writer Chris Claremont and artist Michael Golden as they teamed up two other fan-favorites, the X-Men's Angel and Spider-Man." ^ DeFalco "1980s" in Gilbert (2008), p. 203: "[Rogue's] first published appearance occurred in The Avengers Annual #10 by Chris Claremont and Michael Golden." ^ Sanderson "1970s" in Gilbert (2008), p. 188: "In this issue [#118], by Chris Claremont and John Byrne, the X-Men arrived in Japan, where Wolverine met and fell in love with a shy, quiet woman named Mariko Yashida." ^ Sanderson "1970s" in Gilbert (2008), p. 176: "British-born writer Chris Claremont and artist Herb Trimpe created a new super hero specifically for Marvel's readers in the United Kingdom." ^ DeFalco "1980s" in Gilbert (2008), p. 233: "[Claremont and artist Alan Davis] produced Excalibur Special Edition, a graphic novel about a team of superheroes based in England." ^ Manning "1990s" in Gilbert (2008), p. 255: "It was a matter of simple addition. Take Chris Claremont, the writer who had made The Uncanny X-Men the continual hit that it was, and add Jim Lee, the artist who had reinvigorated the title's popularity in recent months...The sum of all these parts was X-Men #1, the best selling comic book in the history of the medium, selling well over eight million copies." ^ Morse, Ben (August 10, 2010). "SDCC 2010: Marvel Breaks World Record". Marvel Comics. Archived from the original on 2010-11-25. Retrieved 2013-12-01. ^ Miller, John Jackson (November 16, 2010). "X-Men #1, One Piece, and world records". The Comichron. Archived from the original on October 16, 2013. ^ a b O'Neill, Patrick Daniel (June 1993). "Claremont Returns With the Write Stuff". Wizard (22). pp. 28–35. ^ "Bye Bye Marvel; Here Comes Image: Portacio, Claremont, Liefeld, Jim Lee Join McFarlane's New Imprint at Malibu". The Comics Journal. Seattle, Washington: Fantagraphics Books (148): 11–12. February 1992. ^ Ekstrom, Steve (February 6, 2009). "NYCC '09: Claremont and the X-Men: With a Twist". Newsarama. Archived from the original on June 30, 2013. ^ Phegley, Kiel (April 7, 2010). "Claremont Unveils X-Women". Comic Book Resources. Archived from the original on July 22, 2012. Retrieved November 30, 2013. ^ Johnston, Rich (January 14, 2014). "Chris Claremont And Todd Nauck On New Nightcrawler Comic?". Bleeding Cool. Archived from the original on March 4, 2016. ^ Damore, Meagan (April 9, 2014). "Nightcrawler #1". Comic Book Resources. Archived from the original on September 7, 2017. ^ David, Peter (May 1, 2009). "The Best There Is At What He Does…and What He Does is Set Up Other Movies". PeterDavid.net. Archived from the original on July 4, 2013. ^ Hendrix, Grady (April 30, 2009). "I Heart Wolverine". Slate. Archived from the original on July 24, 2013. ^ "Comic New York: A Symposium". Columbia University. March 24–25, 2012. Archived from the original on December 1, 2013. Retrieved March 29, 2012. ^ "Panelist Bios". Columbia University Libraries. 2012. Archived from the original on January 21, 2013. Retrieved March 29, 2012. ^ Claremont, Chris (2006). "Introduction". Modern Masters Volume 6: Arthur Adams. Raleigh, North Carolina: TwoMorrows Publishing. p. 5. ISBN 978-1893905542. ^ Miller, John Jackson (June 9, 2005). "CBG Fan Award winners 1982-present". Iola, Wisconsin: Comics Buyer's Guide. Archived from the original on September 25, 2013. ^ a b c d "Previous Winners 1979". Eagle Awards. 2013. Archived from the original on October 23, 2013. Retrieved November 30, 2013. ^ a b c d "Previous Winners 1980". Eagle Awards. 2013. Archived from the original on October 23, 2013. Retrieved November 30, 2013. ^ "Previous Winners 1984". Eagle Awards. 2013. Archived from the original on October 23, 2013. Retrieved November 30, 2013. ^ "Previous Winners 1986". Eagle Awards. 2013. Archived from the original on October 23, 2013. Retrieved November 30, 2013. 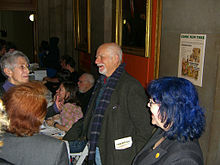 Wikimedia Commons has media related to Chris Claremont. Chris Claremont at the Unofficial Handbook of Marvel Comics Creators. "Pete's Basement Season 2, Episode 5 Part 1- 02.10.09". Pete's Basement. 2009. "Chris Claremont Checklist". Bullethole Studios. Privman, Olga (August 21, 2009). "Review Fix Exclusive: Chris Claremont Interview". Review Fix. Giannitsos, Marina (May 11, 2010). "Forever Passionate: Interview With Chris Claremont". Wild Gunmen. ComicsVerse (April 12, 2016). "Podcast Episode 72: Chris Claremont Interview". ComicsVerse (August 27, 2016) "Chris Claremont interview at Flame Con 2"